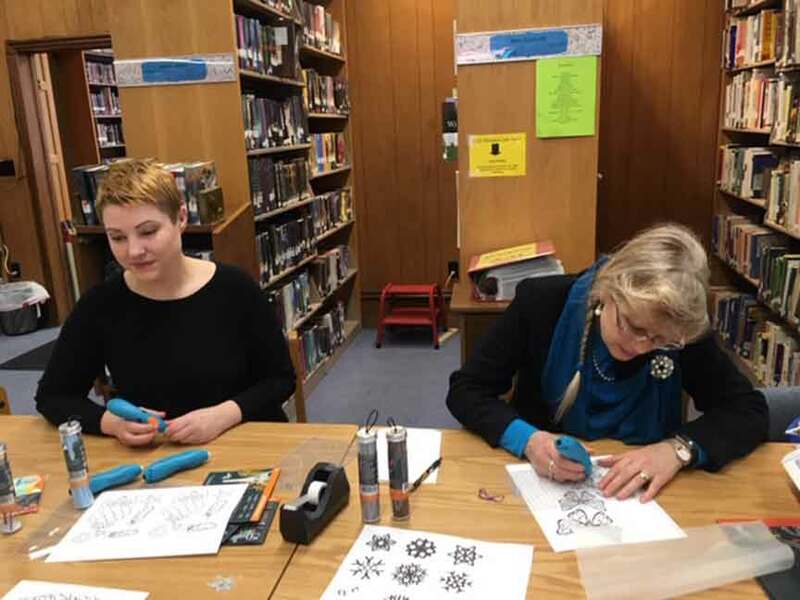 LINESVILLE – Fancy pens and coloring books lined the tables on Monday, Jan. 28 at Linesville Community Public Library thanks to a new doodle art program as organized that afternoon for patrons through Erie and Crawford County District Programmer Abby Texter.(Feb. 1 edition). According to Library Director Telce Varee, Texter has been offering several new programs at their library and other libraries throughout Pennsylvania last year and this year provided a fake news program, an escaper room program, as well as just started up a sign language program this month. In regards to what the doodle art program would consist of that day Texter explained had to do with creating art much like 3D printing but by using a fancy pen. Of the community members that stopped in to participate or watch how it was done that day included Espyville resident Sharon Abraham, as well as Linesville residents Kathy Utz, Kathy Baldwin and Gula Smith. “Mondays I usually come for the Knit and Stitch so I thought I’d observe this for a little while,” said Smith regarding her reason for attending. In addition to the doodle art program Varee said that the library also plans to offer their annual magazine sale from Feb. 1 through Feb. 28 at a cost of $1 for four magazines or 30 cents each (until they run out), as well as will be providing another free sign language program involving the alphabet and every day signs through Texter on Saturday, Feb. 2 from 10 a.m. until Noon which requires registering ahead. Other programs offered regularly at Linesville Community Public Library she said includes a 10 a.m. story hour for preschoolers on Wednesdays, a therapy dog reading program for grades seventh grade and lower on Thursdays from 5:30 p.m. until 6:30 p.m. (weather pending), as well as offers a Knit and Stitch program on Mondays from 1 p.m. until 4 p.m. Hours at Linesville Community Public Library are Mondays 9 a.m. until 5 p.m., Tuesdays and Thursdays from 4 p.m. until 8 p.m., Wednesdays 9 a.m. until 1 p.m., plus 4 p.m. until 8 p.m., Fridays 9 a.m. until 1 p.m. and Saturdays 8 a.m. until Noon, as well as are closed on Sundays and Holidays. For further information on Linesville Community Public Library or their programs please call (814) 683-4354 or stop in at its location of 111 Penn Street in Linesville, Pa.
Pictured: Abby Texter and Telce Varee teaching and trying out doodle art within Linesville Community Public Library this past week in Linesville.